Widely acclaimed as one of the best on the circuit, the Ultimate After-dinner Golf Show starring Billy Flywheel is sheer wonderment and artistry. Along with Billy's zany humour, the show is fully interactive with the audience, and the participants who will be involved in the routines, are chosen at random by the audience themselves. 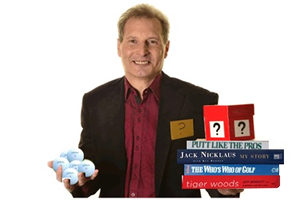 Mind reading from a selection of golf books and autobiographies. Golf ball tricks, including a Strength and Bravery Test where someone as hard as they try, are unable to lift a small box containing one to six golf balls, the number depending on the shake of a dice. There is an ‘Imaginary Tee Off’ where a person signs a golf ball that disappears and goes way off course, but is found in a most unbelievable place covered in sand. A Crystal ball is brought out to reveal both a prediction and a secret about one of the guests in the audience. There will be a chance to win a monetary prize. In an incredible finale to the show, using six members of the audience and a Golf Club directory that lists over 2500 course details, Billy will predict both the name and telephone number of a Golf Club chosen at random from the directory by an audience volunteer. 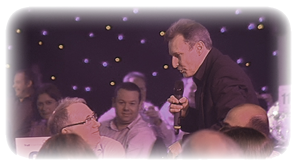 Whether it be a Corporate Golf Event, Company Golf Day, Captains Dinner or a Fundraising event, the Ultimate After-dinner Golf Show is a jaw-dropping spectacle from start to finish.